What do you a call a tire that never goes flat? According to Michelin, the manufacture, it's not a wheel but a Tweel, and it's available only on John Deere Ztrak series riding lawn mowers. Imagine the perfect riding lawn mower: Are its tires low-maintenance and highly durable, and do they make for an impeccably smooth ride? 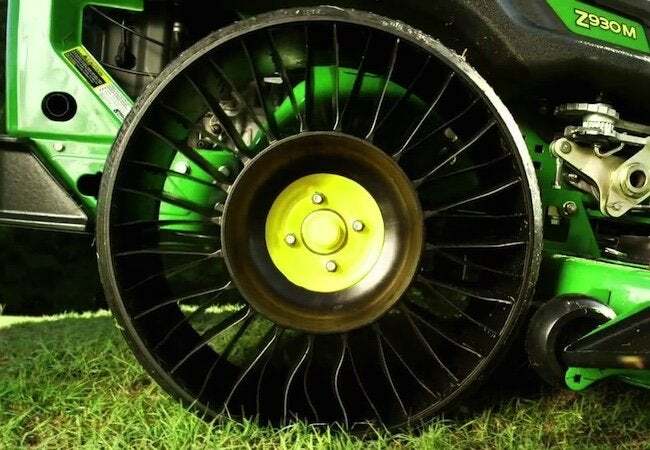 As if in direct response to the fantasies of outdoor equipment enthusiasts everywhere, Michelin has quite literally reinvented the wheel with its launch of a product called X Tweel Turf. Now available only as an option for the John Deere ZTrak series, the Michelin offering manages to challenge nearly every preconception regarding what lawn mower tires look like and how they behave. For starters, the Michelin Tweel never needs air, never goes flat, and never requires patch repairs for any punctures. That’s not to say Michelin has created an invincible lawn mower component. However, compared to conventional pneumatic tires, the Tweel lasts two or three times as long. Then, of course, is the remarkable appearance of the Tweel. From the side, it resembles the intake of a jet engine. But those fines are not made of metal. They are collapsible poly-resin. So when the riding mower goes over rocky terrain—or the curb of a sidewalk—the Tweel compresses so as to prevent a bumpy experience. Another innovation of the Tweel is its unprecedentedly wide, traction-boosting surface area. That feature adds further stability, giving the operator extra confidence on the side of hills, for instance, or where mud would, under usual circumstances, pose a challenge. Finally, there’s the fact that, in the absence of variable tire pressure, Tweel makes it possible for the mower blade to remain always at the desired height, so you get predictable, consistent results each time you cut the grass. 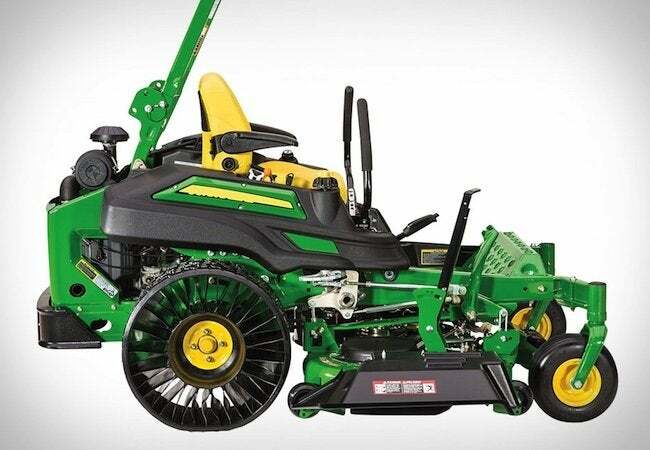 With all its many functional attributes—and yes, its fantastic design—we hope John Deere decides to add the Tweel to more mower models someday—and soon! For more information, visit John Deere.